Please Note As of 3/1/13, this MKAL is finished but the completed pattern PDF is now available at the link above. Please feel free to continue checking the group threads and blog posts linked below for reference if needed. From now until the start: There is NO official sign up for the KAL. Feel free to join in the conversation on the Jimmy Beans Wool Group thread (linked below) and start your project page and tag it appropriately. Gather your yarn and needles in preparation. Other then that, kick back, relax, and enjoy the holidays! Monday, Dec. 31st: I will kick off the KAL on on the Jimmy Beans Wool Blog giving you all you need to know to be prepared for the KAL- (needle size, gauge, etc.) so that you can swatch and be ready for the KAL. Sunday, Jan 6th: I will post the first clue to the blog so that we can all cast on together for the season 3 premier of Downton Abbey! 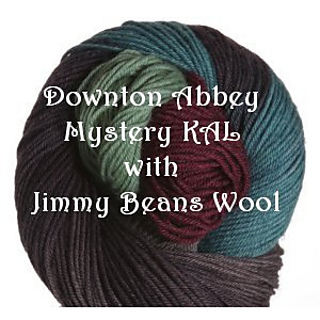 I will release a new clue each Sunday on the Jimmy Beans Wool Blog for the duration of the season which is 8 episodes. Be sure to check in on the Jimmy Beans Wool Ravelry Group for discussion and updates! If you’ve never done a Mystery KAL before, never fear! This pattern is going to be intermediate skill level pattern with an option to simplify if necessary. Also, part of the fun is that it’s a mystery and that you’ll be knitting it along with a bunch of other knitters here on Ravelry! We hope you’ll join us!!! Once the KAL is over, the pattern will be released as a free download from Jimmy Beans Wool. 12/11/12- Update--Because some folks have expressed that it’s difficult to get needles in the timeframe I’ve provided, I’ve decided to release the needle size needed. You’ll need US size 3 DPNs or a circular to do magic loop if you prefer. I knit very close to gauge so if you are loose or tight, consider going up or down a size. Gauge is important for this pattern. 12/21/12- PLEASE NOTE If you ordered your Sportmate yarn in the Downton Abbey color from Jimmy Beans Wool on 12/21 or later, and the date did not say that it will ship on 12/28, then your yarn will NOT arrive in time for the KAL to start. Lorna’s Laces is dying these for us as quickly as possible. Please keep this in mind when making your yarn choices. If you ordered before 12/21, your yarn will still ship in time. Thanks so much for participating!